The best ethnic jackets for men are crafted out of the best material -- here's a light blue one made of Tussar Silk that's sure to turn many heads. Dappled with red and orange print, the piece is best contrasted with light bases, ideally whites and creams. Button it up and you're ready to go. Ok, we know some of you are too lazy to put an ensemble together yourself, so we found you the whole outfit, you're welcome. Pair this yellow-and-blue button-up ethnic jacket with one of these five readymade Dupion Silk bases: beige, charcoal, teal, navy or maroon. 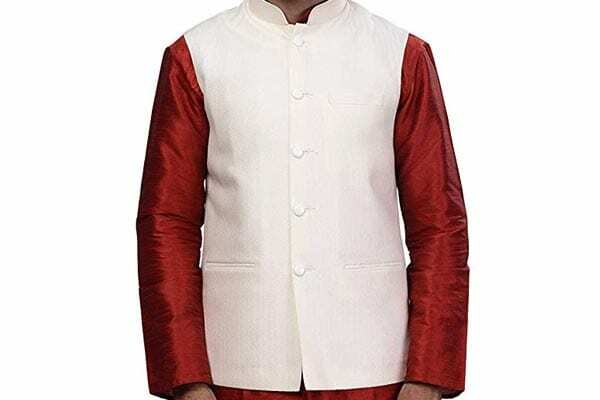 For a truly unique look, try this assymetrical piece, one of the best ethnic jackets for men in India in the edgy segment. It features buttons on the far right, a triangular hem and three little pockets. Contrast it with a light base -- we recommend whites, yellows, light blues and light pinks. 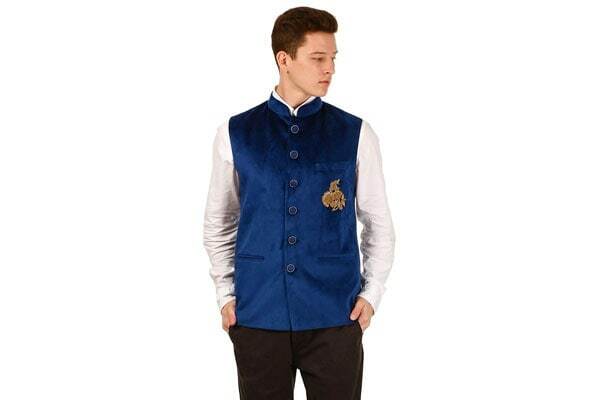 Looking like a king is easy with a royal blue ethnic jacket -- try this Shri Ram & Sons Solid Blue Waistcoat with emblazoned golden flowers and a Mandarin collar. It's made of Teri Rayon, and can be paired with both Indian and Western outfits. The piece buttons up neatly and has three pockets. There's no combination like a solid red and gold. 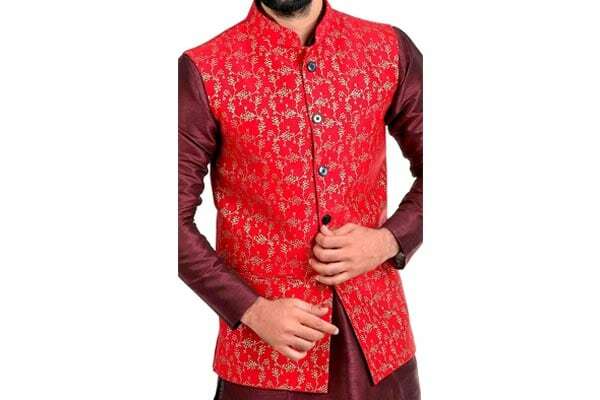 One of the best ethnic jackets for men in India, this piece features button-up detail and twisting Banarasi golden print on a bright red base. Pair this jacket with whites, creams, maroons and golds, and you're certain to impress just about anyone. 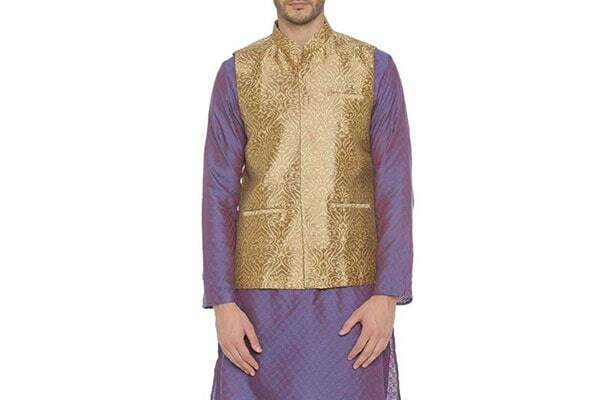 Men who like keeping it simple can opt for this Beige / Gold best ethnic jackets for men. The piece features two slit pockets on the side and one inside, for both aesthetic and functional use. We recommend you accessorize the pockets, since the piece is a bit plain otherwise. 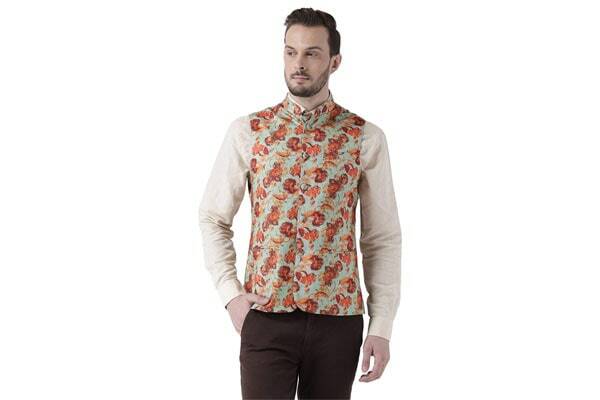 Alternatively, pair it with a patterned kurta. 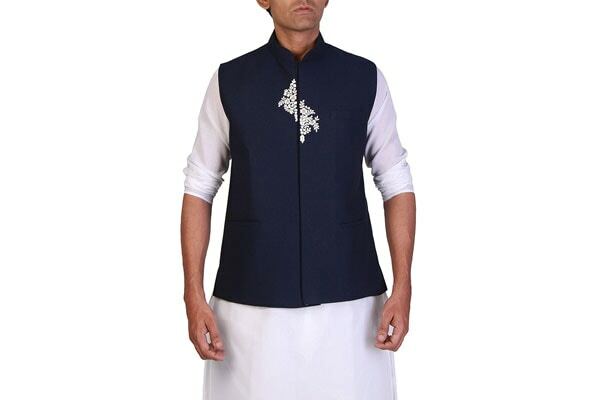 Navy blue will never go out of style, and here's one of the best ethnic jackets for men that proves it. The plain piece is crafted out of viscose and features three front pockets, a banded collar and gold floral detail in the centre. We recommend complementing this jacket with a light base. There's a lot happening on this cotton jacket, and we love it. 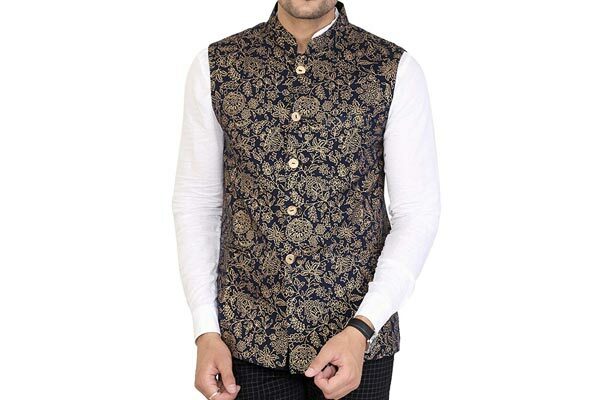 It's one of the best ethnic jackets for men to opt for if you're looking to grab eyeballs; the piece's navy base is laced with light-yellow floral pattern all over. Pair it with a non-crowded base to look your best; or if you're feeling extra-bold, try pattern-on-pattern. 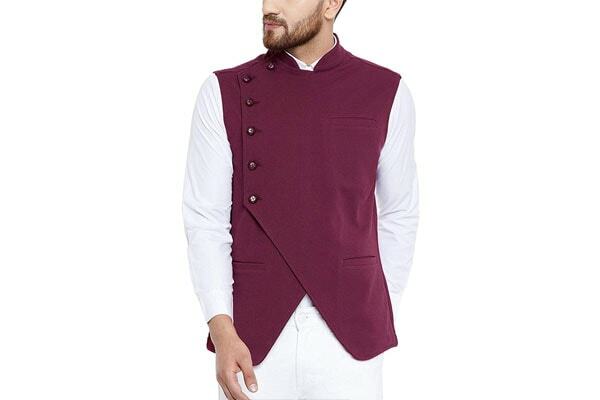 OSHANO Cotton Printed Brown Men's Sleeveless WaistCoat (OSH_JWC_PRINT_50_42),waist coats for men, waistcoat for man, nahru jacket, jacket, nahru jacket for man. 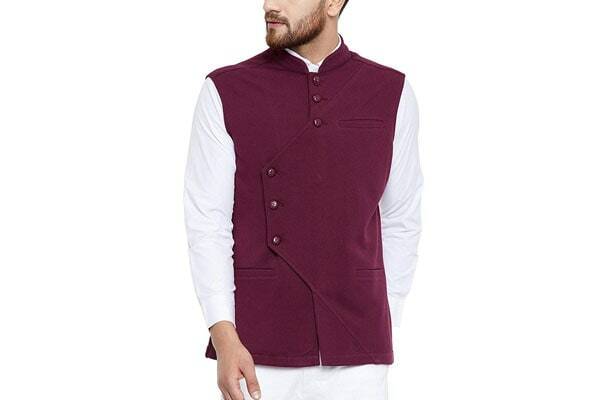 This angular cotton ethnic jacket is maroon all over, so it can be paired with a variety of kurta bases. The piece features three pockets and button details in the front. One of the best ethnic jackets to wear to casual-formal settings, like your office party or a reunion. If you're attending a wedding, though, opt for something more regal. 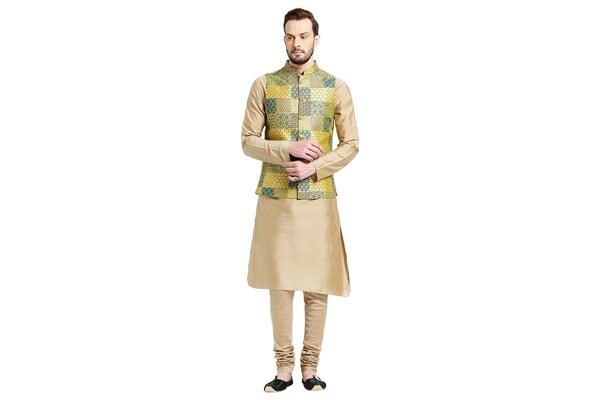 Beige-golden is a versatile colour you can pair with almost any kurta, so if you have a shortage of (kurta) options or don't want to spend time looking for a base to match, this piece by Pantaloons one of the best ethnic jackets for men to get. Made of polyester, it features button-up detail, a band collar and three front pockets.